The more we find out about Victoria Gardens the more interesting it becomes. It is likely to become a focal point of the future. It seems that the Gardens hold many secrets - and we intend to reveal as many as possible. 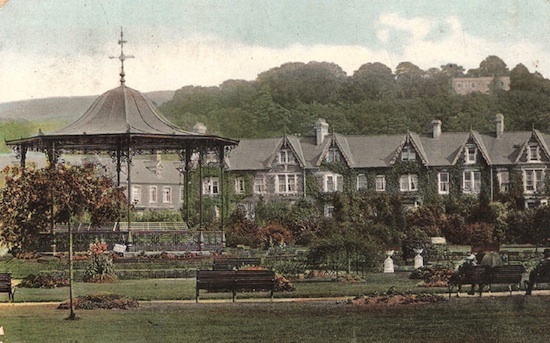 The Victoria Gardens were, in the mid 19th century, known as Mera Field which was owned by the occupier of the Gnoll House, Henry John Grant. In 1856 the Neath Borough Council purchased the field from Henry John Grant in an effort to provide the town with some open space and at this time the site was called the ‘Corporation Field’. In 1895 the Mayor, Aldermen and Burgesses of Neath purchased from Evan Evans Bevan 20 cottages and the Cross Keys public house that occupied the corner of Victoria Gardens, now situated nearest to the new Cross Keys public house adjacent to the gardens. The Neath Fair occupied the Mera Field site from 1856 until May 1897 when the Neath Fair was moved to its new position, that being the site of the old Civic Centre. In 1897 the existing park was laid out by Thomas John Snow who was a local builder and whose company operated in Neath between 1881 and 1925. The marble pillar gates nearest to St David’s Church on the main entrance to Victoria Gardens were officially laid on the Diamond Jubilee of Queen Victoria to celebrate her 60th year of reign on the 22nd June 1897. A stone was laid by the Mayor of Neath, Arthur Russell Thomas, to commemorate this fact. The marble pillars on the entrance way were donated by Thomas Snow and the marble was imported from Italy . The park at this time was known as Neath Recreation Ground. The park was officially renamed and opened on the 30th June, 1898. At the time of the opening the Victoria Gardens were larger than they are today as the new bus station occupies part of the former Gardens. The two timber framed shelters at the station end of the Park were erected at the same time as the bus station. The park was originally laid out with iron railings running around the perimeter and these remained in place until WWII when there was a major drive throughout the country to obtain metal for the manufacture of armaments, resulting in the railings being removed from the Gardens. After WWI there was a tank situated there also alongside the potting shed where it remained until it was taken away for scrap during WWII. The Gorsedd Circle within Victoria Gardens has been used in the past to celebrate the National Eisteddfod coming to Neath. The first use of the Gorsedd stone was on the 6th of August 1918 and subsequently at the 1934 Eisteddfod also held at Neath. A number of features currently within Victoria Gardens have been relocated there from other locations within the borough. The statue of Howell Gwyn was moved there in the 1960s from its original place on the forecourt of the Gwyn Hall where he stood for 60 years before being moved. The statue originally pointed to the house where Howell Gwyn was born (where Argos is now), and when it was moved it was made sure that the statue continued to point in that direction from the Gardens. George Eaton - A History of Neath 1987 - (page 170) throws more light on the subject - "The impressive number of parks and playing fields under corporation ownership today had their genesis back in 1856 when the council acquired what was to be called the Corporation field. Here football and cricket were played and fairs held up to the time of it's conversion into Victoria Gardens Park . The was done to commemorate the Diamond Jubilee of Queen Victoria in 1899.